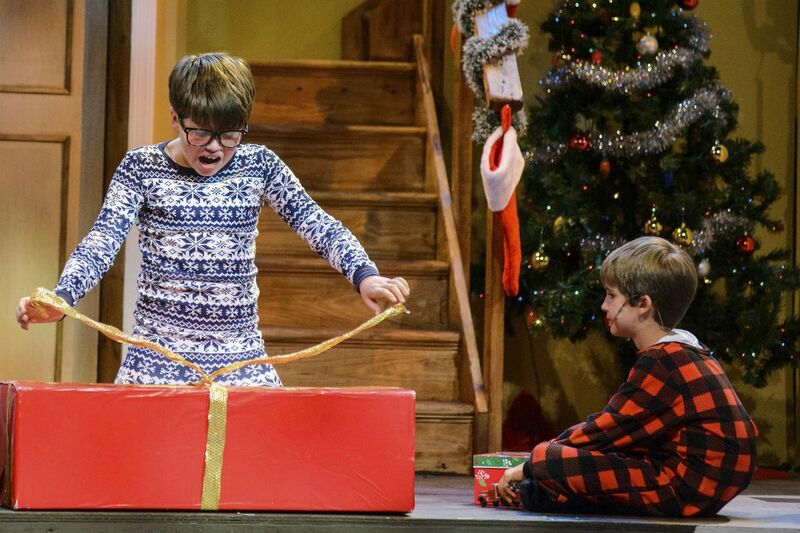 (From left to right:) Ralphie (Ben Pedersen) opens his Christmas gift while little brother Randy (Aidan Crane) watches with anticipation. From "A Christmas Story" at The Media Theatre. Some things stay the same. All Ralphie wants for Christmas is a Red Ryder Carbine Action 200-shot Range Model air rifle. But in other ways A Christmas Story, The Musical (2012), now running at The Media Theatre, puts a fresh spin on the 1983 movie. The book by Joseph Robinette hews to the original, but doubles down on nostalgia by backdating the story to 1940. The narrator is now physically present, legendary radio raconteur Jean Shepherd, played by Kelly Briggs. And director/choreographer Dann Dunn seizes on the snappy score of Benj Pasek and Justin Paul to create colorful and peppy dance numbers that alter the dark undertones of the holiday classic. Thanks to set designer Kyle Brylczyk, Christmas shifts scenes in and out of the Parker family home - so you revisit all major events, such as The Old Man's obsession with a ludicrous leg lamp, Ralphie's struggle with bullies, the grumpy Santa, and Flick's tongue frozen to the school flagpole. The large cast is a mix of kids and adults. Jennie Eisenhower and Patrick Ludt shine as Mom and The Old Man. Krissy Fraelich is dowdy schoolteacher Miss Shields. Ben Pedersen and Aidan Crane star as Ralphie and Randy (although for this production, all kid roles are double cast with two actors). The beating heart of Christmas is your sympathy for the two dreamers. The Old Man bares his vulnerability in the songs "The Genius on Cleveland Street" and "A Major Award." Ralphie has a reverie about besting all the bullies of the world with his Red Ryder BB gun in "Ralphie to the Rescue." Miss Shields warns Ralphie in "You'll Shoot Your Eye Out." Mother concurs in a nurturing way and celebrates all housewives in "What a Mother Does." She sums up the moral of the tale: Dreams may crumble, but an enduring sense of family value is always left standing. You still feel the wide-eyed love children have for the magic of the moment, and the adult's unspoken mourning for the passing of time. But by expanding solo songs into lavish ensemble numbers the musical cheers you up, infusing new notes of holiday spirit and community solidarity into the original story. A Christmas Story. Through Jan. 8 at The Media Theatre, 104 E. State St., Media. Tickets: $25-50. Information: 610-891-0100, mediatheatre.org.